Conventions are almost always more enjoyable when you’re attending with a friend or a loved one. And that goes double for cosplay. Couple and group cosplay can be a whole lot of fun. But what if you’re struggling to come up with ideas of who to cosplay as? Well, there are a lot of fun character pairs in various movies, television shows, comics and anime series that would work well as couples convention costumes. I’ve included a list of 100 ideas below, and have broken them down into pair types (male + female, male + male, female + female, and dual gender/gender neutral/transexual) based on the gender of the character. 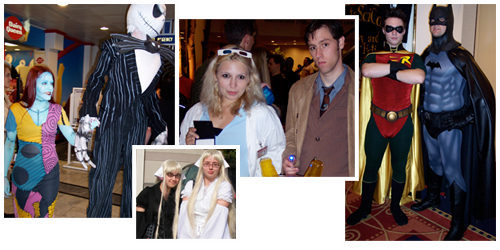 I’ve also tried to select cosplay ideas with different ages, body types, ethnicities, hair colors, and genres in mind. Of course, you don’t have to limit yourself to cosplays that match any of those, including gender. You’ll also note that not every pair is romantically connected – this is a list for cosplaying friends and couples. Feel free to add suggestions of your own by posting a comment!